A fast-moving brush fire erupted near the 15 Freeway in the Rialto and Devore area of San Bernardino County late Tuesday. 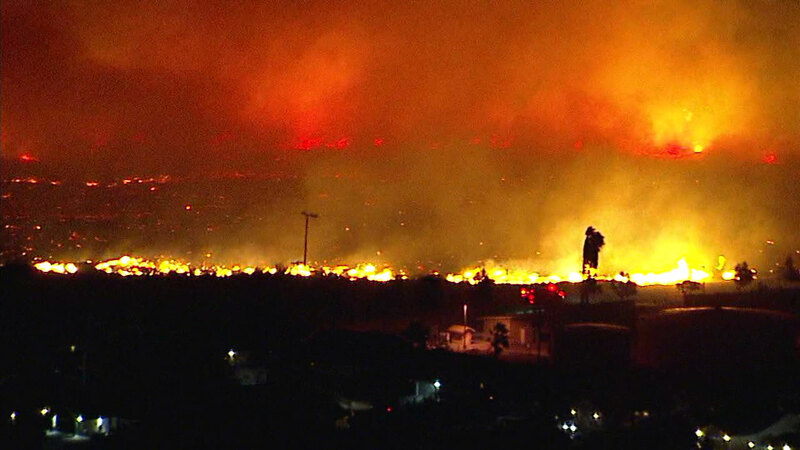 RIALTO, Calif. -- A brush fire in the Rialto area of San Bernardino County burned more than 140 acres by Wednesday morning after erupting the previous night. The blaze, dubbed the Sierra Fire, was reported shortly after 9 p.m. on Tuesday near Sierra and Riverside avenues, according to the San Bernardino County Fire Department. By Wednesday morning, the fire burned 147 acres. The fire appeared to lose strength as it moved south and away from homes late Tuesday night. It had grown from about 3 acres to approximately 20 acres within minutes as the fire. Several firefighters in fire trucks and a bulldozer immediately responded to the blaze while strong wind gusts appeared to move most of the flames away from nearby homes. Despite the direction of the fire, embers from the blaze jumped Riverside Avenue, where some backyards and at least one palm tree caught fire in the Ferguson Park neighborhood. Firefighters worked against the 50 mph winds to spray water on the flaming palm tree, whose glowing embers jumped on multiple houses and caused major concern. A number of power lines also appeared to catch fire as the wind-driven flames continued to quickly move near the neighborhood. Lights were also out in some parts of the area. No structures were spotted on fire. Meantime, footage from AIR7 HD showed residents packing their vehicles, though no official evacuation orders were announced. Traffic also built up along Locust Avenue as homeowners attempted to flee the area. According to the San Bernardino County Fire Department, a total of 26 engines, seven handcrews, three bulldozers and one sheriff's department patrol helicopter were assigned to the fire. For more stories and videos related to the wildfires burning across California, visit this page.